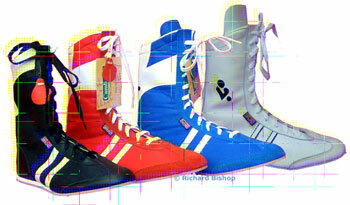 Boxing boots & Wrestling boots direct from the manufacturer at competitive prices. Hand made in England since 1969. Wrestler is back and better than ever. Please note:- ALL boots sent outside the UK ADD is £20 postage. Four decades on and Richard Bishop Footwear continues to manufacture competitive ringside boots to a high standard and of course at a competitive price. Whether you are looking for boxing boots wrestling boots or specialist footwear you need look no further as we're sure you'll find allyour requirements here from this website. We have been the main manufacturer for boxing boots worldwide for both the big brand name company's and the biggest of world champion names in the game. If you are looking for a custom made pair of boots boxing or wrestling to stand out from the others we can adjust for your needs. 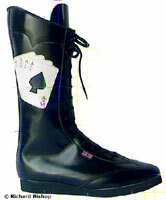 Why not have a hand made pair of boots at competitive rates made by the same hands that make for world champions. We can now exclusively offer our own independent designs direct without you paying retail prices for far east manufacturing, so why not take advantage of British made and give us a call today.